Now, slowly and later than normal, the mid-March sun has gained strength, and at last the earth has begun to respond in hit-and-miss fashion. With a random day here and there in the 30s or 40s or 50s, we feel oddly comfortable after the arctic extremes that have reigned for so many months. This week we are seeing a softening. The night-time low temperatures are mostly staying near freezing and rising a bit in the day. The grass is beginning to appear here and there after our winter without it. And today the sun is bringing us up to the 50s! There by the window, Dog, you are driving us nuts with your barking. And what is the cause? You are seeing the squirrels! Now you REALLY go ape, and you urge us to share what you're seeing; and what IS it? It's the mallards! 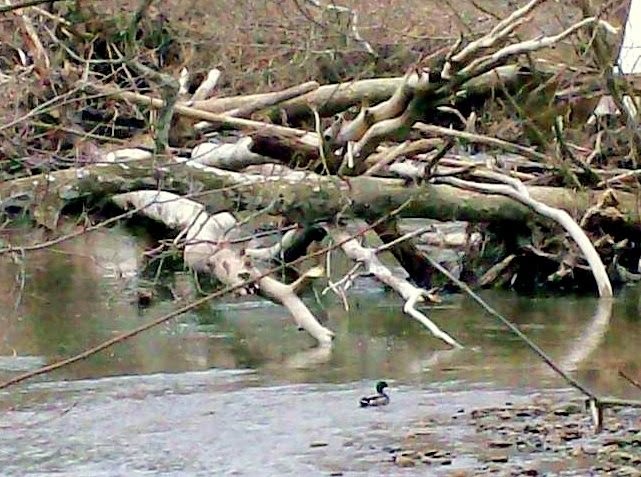 a courting couple down in the creek, trolling the waters in peace in the sunshine. In this winter valley that has seemed to collect all the cold in one place, the mallards are victory. Their arrival may be later than normal, but they are an absolute message of springtime. Bark all you want, Dog; the mallards are welcome, and we can rejoice! 'WHAT'S BLACK AND WHITE AND COLD ALL OVER?--WINTER 2013 TO 2014! Most people know me as a woman who finds beauty in all four seasons of the year and looks at winter itself with "Rose-colored" glasses. This winter in my northeast Ohio valley, however, has been brutally cold with many sub-zero temperatures and a whole lot of snow, complete with all the extra work such weather entails. On many a morning, I have crawled out of warm covers to accompany my dog into the storms on his dawn "duty calls." When I would encounter minus-13 degrees, with high winds, I would groan like an old tree! And my dog seemed to feel the same. Winter has frozen my fingers and come close to freezing my spirit. My most healing tonic has been to plant myself like a slug in front of my wood-burning stove and allow my day-dreams to speak only of springtime. The stove itself has required endless effort to keep it filled and perking, but its warmth is a comfort after braving the storms to shovel the walks, steps and porches. --A snow pile that is almost hiding my house. 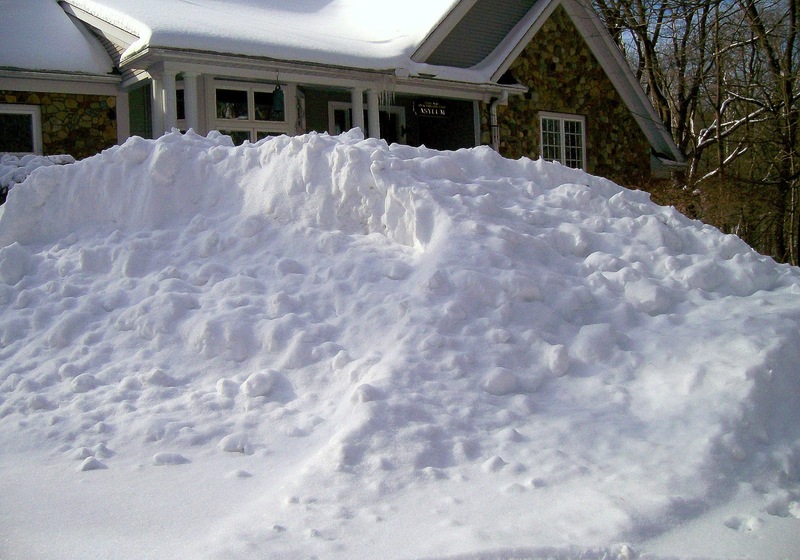 This "glacier" was created by my snow-plow man as he began to run out of space for the snow piles. --A dog walking in fog amid a minor (and very temporary) thaw. As you can see, my normally boisterous dog Mick is obviously beginning to feel a bit a bit hang-doggy himself! --A big dog well covered with snow flakes. This "dandruff dog" photo was taken in the last days of February in a noon-time white-out, when Mick refuses to step off the porch into the snow and the wind and the cold. --A woman and a dog dressed in blue winter clothing. You might think it's Yeti and the Bear, but it's really just Mick and his person (me) on a minus-13 morning as February moved into March. We had come in from Mick's early-morning "duty call," with Mick in a thick coat lovingly knit by a friend; and Mick's person fashionably dressed in TWO winter coats, a face scarf, thick snow boots and big thick gloves. Notice the eyeglasses coated with frost! 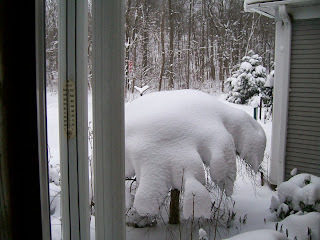 --A snow-covered garden tree that looks like it's carrying a fat animal on its back. 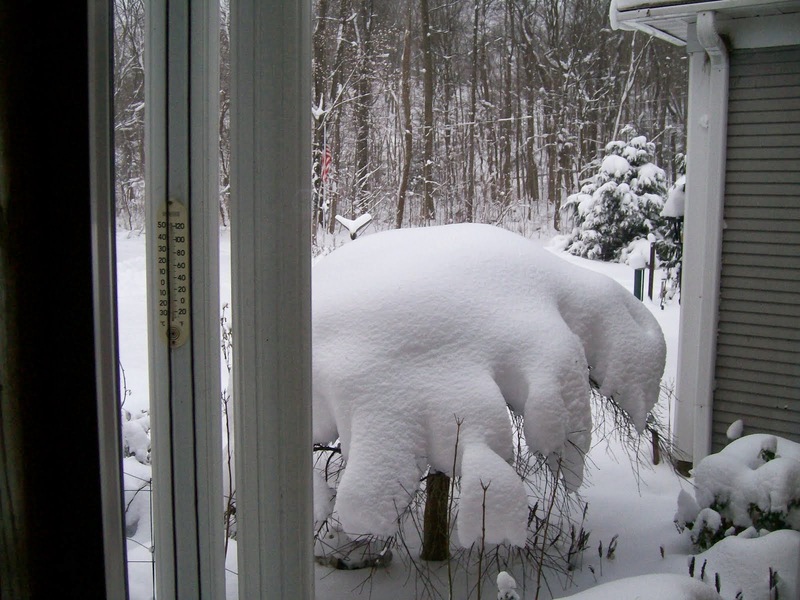 It's my prize dwarf maple tree, draped in a cold snow-sculpture that looks more like a fat mammoth. I SHARE THESE PHOTOS TODAY---ST. PATRICK'S DAY 2014. Believe it or not, the dawn of this day saw me and my dog walking out into 11-degree temperatures, to navigate the leftover snow and frozen mud and icy paths! This is the winter that was and still IS! It is testing patience and positive nature and my long-standing love for this Land of Four Seasons in which I have happily lived all my life.